“The most Wonderful Place on Earth” according to Matt B on Tripadvisor. We would have to agree with Matt on this one. Aqua Shop is one of the best places to bring the whole family to have fun. Founded in 2012 Aqua Shop is the first “Flow House” to bring FlowRiding to the masses. In the past, Flowriders were treated as a stage for professionals to showcase their skills and entertain a crowd. Flowboarding is their passion, and they decided to take their mission to spread the love, they’re making it a different approach! 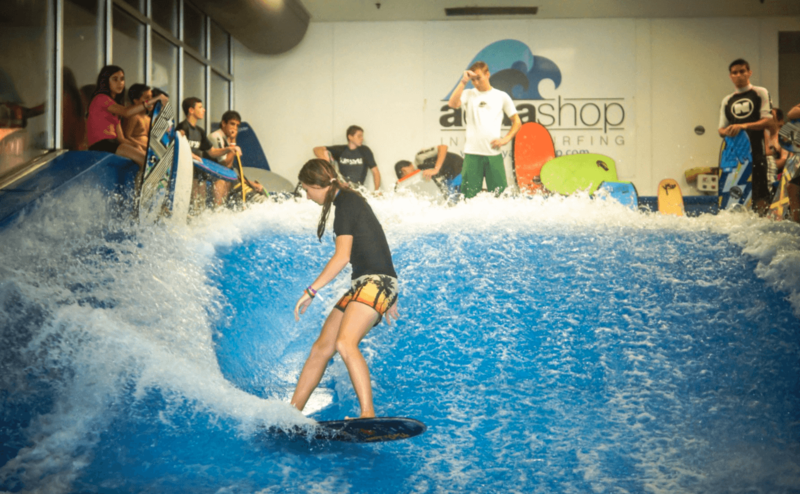 Offering the first indoor Flowrider, Aqua Shop opened the Flow’ to anyone and everyone interested in learning the sport. Aqua Shop quickly found that by doing this, they were growing right along with the sport. At first, their instructors started to compete, making a name for themselves and our shop. Soon after, their customers began to join our pursuit for glory. Professionals like Nick SP, Sean Silveira, Scott Callens and Zack Lenz all got their start at Aqua Shop. Nowadays, it’s not unlikely to find yourself riding with a world champion. Flowriding is a family, and they take care of their own. If you’re new to the sport, let them show you the ropes, and take you to the top with them! Have a corporate occasion or a special milestone coming up? Host it at The Aqua Shop! Up to 8 guests can enjoy a private hour on the Flowrider for just $220! Add $100 for an hour in the private party area and you have a uniquely memorable event! Just give us a call at (469) 366-0110 Mention this post and get this AMAZING DEAL!